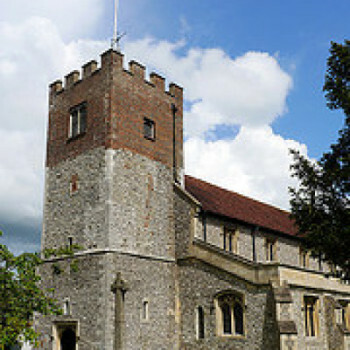 At St John’s, New Alresford, in Hampshire, the ringers have an ongoing project to ring a quarter peal in the months one hundred years on from the death of any Alresford man named on the war memorial in the church. This project started with the publication of a book, Not Just A Name, researched and written by Glenn Gilbertson. This book is a fantastic resource document of the personal, family and service records of all those who served in the armed services and were killed in the 20th century who lived or had links with the Alresford SO24 postal area. There are details in the book of battles, photos of men and places, and locations of cemeteries where the men were buried, or for those with no known grave, the specific memorial where the name is recorded. Glenn Gilbertson, a personal friend, printed out the list of names and dates of deaths for all those men who died in WWI whose names appear on the war memorial in St John’s Church. Thus, when planning quarter peals, all I need do is reference the names each month and write out a piece for our parish magazine, taking the details of each man from the book. Next is to assemble a band of eight ringers for a quarter peal. Luckily there are two evening services each month at St John’s. The choral evensong is the most appropriate service and the quarter peal is publicised in the notice sheet for that week with brief details of the men to be commemorated. A quarter scored, the details are then sent for publication in the Ringing World. Alresford residents are very appreciative of the bells. We quite often receive kind comments for our efforts. Unfortunately, we were not able to locate the names. Guild reports for the relevant years throw no light on them either. There was only one ringer from Alresford who we know to have been killed and that was William James Curtis, DCM. He died on 18th April 1918. He and his father, Walter were both guild members in 1909. Sgt Curtis’s name is on the memorial in Winchester Cathedral’s ringing chamber as well as in St John’s Church. He was buried in Cambrin Military Cemetery, Pas de Calais. We hope that our two new ringers will be worthy successors: St John’s, New Alresford ringers doing their bit to REMEMBER. Last updated Monday, 11 June 2018 at 07:14:07. First submitted Monday, 11 June 2018 at 06:09:13 by Roger Booth. 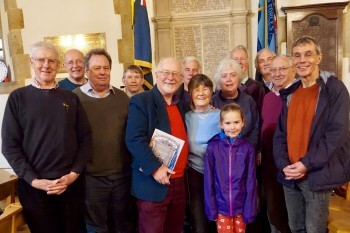 Some of the ringers who have taken part in these attempts, before an attempt on 2 December, which came to grief when the tenor clapper broke. Rear(L to R) - Rob Hatch, Andrew Johnson, John Dodd, Alec Fry, Tony Ayers; Middle - Bruce Purvis, Roger Booth, Glenn Gilbertson (author), Elizabeth Johnson, Teresa Brown, Rodney Skinner, Ian Redway; Front - Susanna Johnson.